I am totally excited. 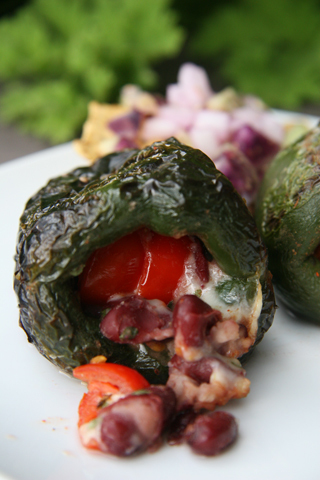 For the first time we made grilled stuffed poblano peppers. Eran deliciosos! We stuffed some fantastic poblanos (from Gresczyk Farms) with pepper jack cheese, red kidney beans, tomatoes (from Wild Carrot Farm), onions (from Taylor Family Farm), and a single "silver bullet" hot pepper (from Urban Oaks Organic Farm). Alongside, we tossed together a quick homemade salsa verde - made with all local ingredients. We feasted outside on the patio and even grilled some peaches for dessert.